Tip-off scheduled for 6 p.m.
Twin Valley South's Mackenzie Neal (left) and Eaton's Becca Mowen battle for position during a summer league basketball game at Richmond (Ind.) High School. The two teams will meet at Eaton on Friday, Nov. 16 for a preview of the 2018-19 season. EATON — The high school girls basketball season doesn’t tip-off officially until next weekend, but Eaton and Twin Valley South fans will get a chance for an early look at their teams this weekend. Eaton will host the Panthers in a preview contest beginning at 6 p.m. on Friday, Nov. 16. The junior varsity teams will play two quarters followed by the varsity teams, who will also play two quarters. Cost for admission is $3. Troy Christian (boys) at Eaton 6 p.m.
Carroll (girls) at Preble Shawnee 6 p.m.
Preble Shawnee (boys) at Brookville 5 p.m.
National Trail (girls) at West Carrollton 9 a.m.
Twin Valley South (boys) home 10 a.m.
Madison (girls) at Tri-County North 11 a.m.
Eaton (girls) at Carroll 6 p.m.
Tri-Village (boys) at Preble Shawnee 5 p.m.
Twin Valley South’s Mackenzie Neal (left) and Eaton’s Becca Mowen battle for position during a summer league basketball game at Richmond (Ind.) High School. The two teams will meet at Eaton on Friday, Nov. 16 for a preview of the 2018-19 season. 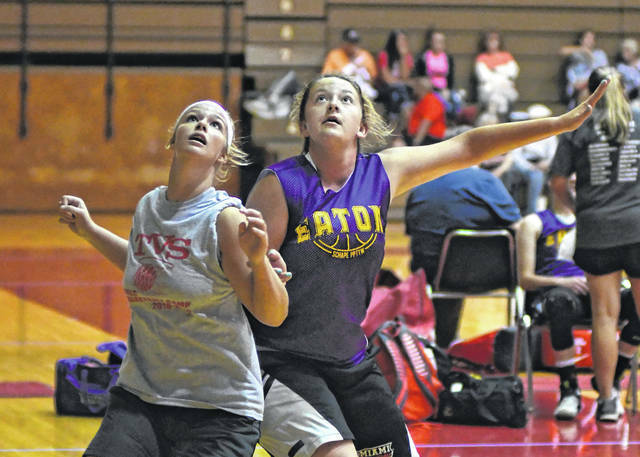 https://www.registerherald.com/wp-content/uploads/sites/41/2018/11/web1_gbk6-1.jpgTwin Valley South’s Mackenzie Neal (left) and Eaton’s Becca Mowen battle for position during a summer league basketball game at Richmond (Ind.) High School. The two teams will meet at Eaton on Friday, Nov. 16 for a preview of the 2018-19 season.